Design Crazy Vehicles to Race Through the Hazardous World of ‘Trailmakers’… Soon! Build, race, crash, rebuild from spare parts, hopefully creating something new and more sturdy at the next accident. Or maybe speed over stability is more your thing in Trailmakers? Your ride, your parts, your design – so long as the vehicle can be driven, anything goes. I think. Well, almost anything, is probably more accurate. Oh, and you have quite a lot of terrain to cross… so better get started! But before any racing can be done, building must be taken care of, and fortunately, you don’t need an engineering degree to handle that aspect of the game. In fact, I’d say the process of assembling a vehicle is a lot like messing around with LEGO, and we all know how easy that is! 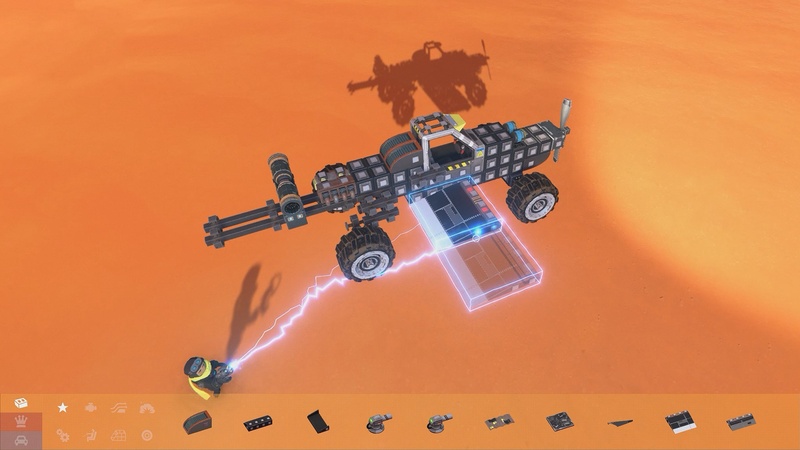 Just keep in mind that, unlike actual LEGO bricks, components in Trailmakers all have unique features: shape, weight, functionality and so on. Doesn’t matter how awesome it may look if it handles like absolute garbage, ya know? Now, once you’re happy with your fancy creation, it’s time to fire up Expedition Mode, which is essentially a fancy word for ‘campaign’, and embark on a journey across a huge world. One which will take you across bone-dry deserts, murky swamps, and through (over?) hazardous mountains. One helluva journey awaits those able to build something capable of surviving all that and more. That is to say, building something capable… eventually. Build cool vehicles and compete in mini-game modes with your friends or other Trailmakers online. Build a helicopter, send it to your friend, and shoot them out of the sky. Put two seats on a tank, and let your friend control the turret. Early on, you’ll have to make the most of what you have – which is not a whole lot. But sooner or later you will gain access to new parts, at which point it’s time to begin experimenting! Oh, and speaking of: those simply interested in building and racing, with fewer restrictions, should stop by Sandbox Mode instead. Here, as the developer puts it, ‘the skybox is the limit’. Vroom vroom! Trailmakers [Early Access] will be available on Steam from January 31, 2018, carrying a $19.99 price tag.